The seasons they are a-changing! Summer is almost gone and fall is coming. Pumpkins, multi-colored leaves, sweaters, crisp mornings and perfect afternoons, hay rides, corn mazes, apple picking, gourds, cornucopias, squirrels burying acorns, and Halloween define the times. After fall, comes winter. And with winter, comes everyone’s favorite: snow. Most of us love to watch the snow fall. Sitting by the fireplace, sipping on a cup of steaming hot chocolate or coffee, watching the flakes pepper the trees, and snuggling under a blanket are some of our fondest winter memories. However, driving in the snow is another matter. If you’re not prepared for winter weather driving conditions, the winter weather could not be so welcome after all. Here at Lee’s Towing of Northern Colorado and Wyoming, we’re prepared for the snowy weather. When the unexpected happens, we’re the tow truck company to call. We offer roadside assistance services, emergency road service, offroad recovery, semi truck towing, and any other towing service needed. Our tow truck drivers are available 24/7 for whenever the weather strikes. Contact us today for more details. That being said, we here at Lee’s Towing sincerely hope you don’t need us this winter. We’ve compiled our best weather driving tips to share with you, so you can stay on the road instead of off it! Get plenty of rest. According to the National Sleep Foundation, most of us need between 7-9 hours of sleep a night. It’s important to be alert and not on autopilot when winter weather hits. If you have a garage, don’t warm up your car inside the garage. You risk carbon monoxide poisoning of both you and your family. Move the car to the driveway, shut your garage door, and then heat up your vehicle. Invest in snow tires. 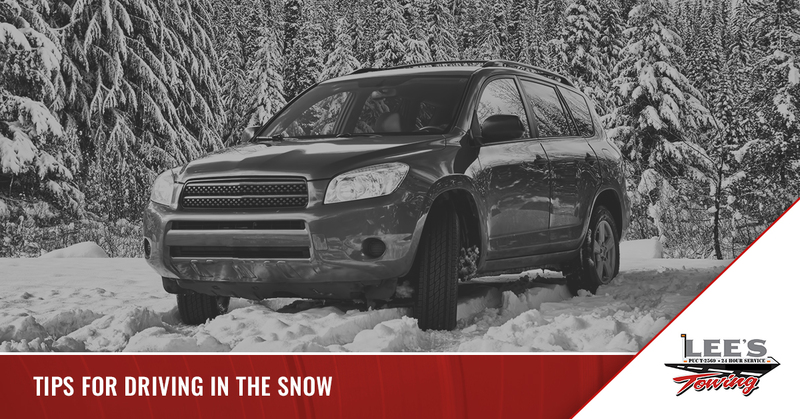 Designed specifically to operate in the wintry weather, snow tires in general have special components and special design features to grip the road better, which improves braking as well as grip. Especially if you live in an area of the country guaranteed to get snow such as Colorado and Wyoming, this is one purchase you can’t afford not to make. Keep your gas tank at least half full. This prevents your gas from freezing up. Also, if the worst does happen and a tow truck company like Lee’s Towing cannot reach you immediately because of your location or your vehicle gets trapped in the snow on a Christmas Tree-cutting adventure, you’ll need your gas for warmth. Don’t use cruise control in ice and snow or on wet roads. If you hydroplane or skids, your car will automatically try to accelerate to keep a constant speed, making it more likely you’ll lose control of your car. Newer cars are now equipped with traction-control systems, which were developed in part to mitigate this effect. Traction control systems stop the spin of tire wheels by reducing the power of your engine, thereby increasing the tires’ grip on the road and enabling acceleration to be smooth. Stock up on antifreeze and window washer fluid. Vital in slush and mush, you don’t want to run out of windshield wiper fluid or your heater to be frozen because you need more antifreeze. Don’t tailgate. You shouldn’t tailgate anyways, but this is especially important in the winter. Stopping radius is increased as moisture builds on the roads. A fender bender (or worse) is never worth it. Slow down. We all know speeding only gets us from point A to point B a slight bit earlier unless you are travelling long distances. You’re less likely to skid off the road and you can stop in a shorter distance. Otherwise, you may need the towing services of Lee’s Towing for offroad recovery. Finally, stay home. Remember watching the snow out your window with a tantalizing cup of coffee in your hand and a cat on your lap? Indulge in this if at all possible unless you absolutely need to leave the house. If you’re not out and about, you can’t get into an accident. Nor do you have to deal with the headaches of driving in wintry conditions. Lee’s Towing sincerely hopes you do not need us this winter season. No one likes being stranded by the side of the road when it’s cold out. If the worst does happen, Lee’s Towing is standing by, waiting to lend a helping hand. We specialize in being there when you need us the most. Offroad recovery, heavy duty towing, and roadside assistance are just some of the towing services we offer 24 hours a day, 7 days a week. Contact us today for all of your towing service needs!